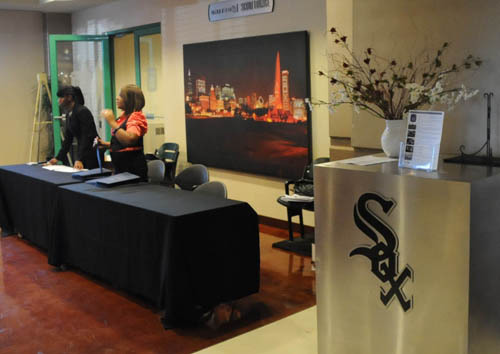 The Chicago Board of Education held a series of public hearings to listen to the community’s concerns over the mayor’s school reform plan. What we wanted to know is who is going to those gatherings. While we found some parents and teachers arguing to keep their local school open, we also found some community pastors busing in protestors to shut them down. We call it rent-a-protester. There were folks who didn’t know what they were protesting, didn’t know the name of the school, and didn’t want to talk at all. George Schmidt, a consultant for the Chicago Teachers union and reporter for Substance News says he has been documenting the school protests since summer. He says some of the protesters were paid 25 dollars to hold up signs in support of the mayor’s reform. 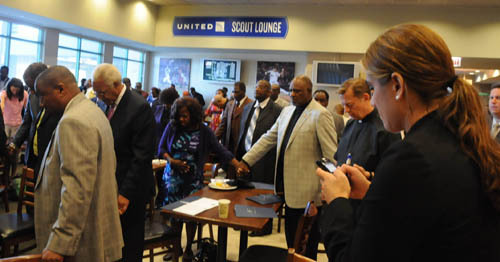 Chicago Public Schools told us there is no money or public support for what the pastors are doing at these hearings. CPS chalked it up to their longstanding interest in education reform. Neither Pastors Barrett nor Watkins returned our calls. The teacher's union is now calling on an inspector general investigation into the rent-a-protesters. 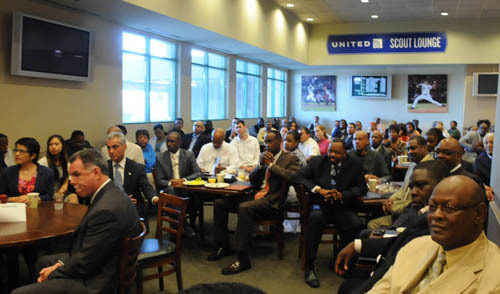 About one-third of the preachers who attended the breakfast at Sox Park on August 25, 2011 can be seen in the photograph above, seated behind Mayor Rahm Emanuel and Police Supt. Garry McCarthy. Substance photo by George N. Schmidt.Thaddeus Scott poses for a photograph outside the HOPE organization, 6921 S. Halsted, Friday, Jan. 20, 2012, in Chicago. | John J. Kim~Sun-Times. Updated: January 24, 2012 8:42PM Always contentious hearings on whether to close failing Chicago schools have taken a bizarre twist this year with charges that cash-strapped residents were hired as “rent-a-protesters” and given pre-made signs and pre-crafted scripts to support school shakeups. Two men told the Chicago Sun-Times they showed up to apply for financial help with their energy bills at the Englewood office of the HOPE Organization headed by Rev. Roosevelt Watkins III, only to be offered money to attend school-related “rallies” held Jan. 6. Watkins denies they were paid to protest, saying money paid was for training. Both protesters said they didn’t realize until the last minute that they were supposed to support school closings. One said he was promised $50 to speak at a rally “for schools,” but was stiffed $25 after Watkins complained he had publicly revealed at the hearing he was “compensated” for speaking. “I don’t want the $25 he owes me,” Thaddeus Scott, 35, told the Sun-Times. “He can keep his dirty money. You can quote that. “Why am I speaking out? Because I am in support of Crane [the high school whose closure he says he was supposed to support]. . . .
Watkins, pastor of Bethlehem Star M.B. Church and founder of Pastors United for Change, acknowledged he organized busloads of people to attend the Jan. 6 school closing hearings. Yellow buses delivered people from 69th and Halsted, where HOPE’s Englewood office is, to at least three closing hearings on that date. The hearings concerned Crane High, Guggenheim Elementary and Reed Elementary, hearing participants told the Sun-Times. One of the most prominent teacher bashers and privatization promoters among Chicago's clergy in attendance at the August 25, 2011 event was the Rev. Michael Pfleger, pastor of St. Sabina's Catholic Church on Chicago's South Side. 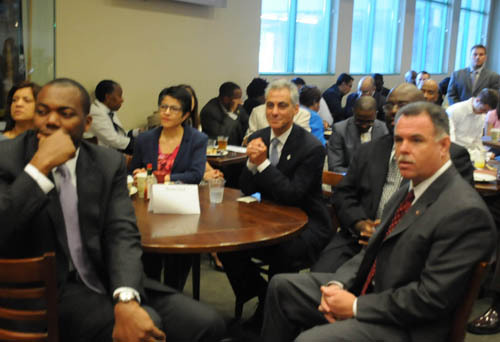 Pfleger has spent most of the 21st Century attacking the public schools and promoting the anti-union alternatives being pushed by Chicago's mayor, first under Richard M. Daley's "Renaissance 2010" program and currently on behalf of the various initiatives of Rahm Emanuel. In 2004, Pfleger helped in the campaign by then Schools CEO Arne Duncan to close and privatize Calumet High School, providing the media with a series of quotes which claimed that Calumet was a "failure" and not a "school of choice" for the community. Calumet was later closed, privatized, and (after more than $20 million in rehab) turned over (for $1 per year) to the Perspectives Charter Schools. Since Perspectives opened "Perspectives Calumet," Pfleger has found nothing wrong with the new setup, which is anti-union, despite repeated scandals at Perspectives, including one involving sexual misconduct allegations that led to the removal of one teacher. Pfleger's alliances with Chicago's mayors and against Chicago's unions have escalated as the 21st Century enters its second decade. Substance photo by George N. Schmidt.Scott said he was offered $50 to speak at a hearing from what turned out to be scripted remarks. “What we do — so you can hear it from the horse’s mouth — we provide training because we engage community activists to participate in things such as health care, affordable housing, education, safety. Those things. So we do training on community organizing,” Watkins said. A “small stipend” helps “offset their car fare” or “babysitting,” Watkins said. A day after the Sun-Times asked Watkins about the payments, at least one protester said he received a call from organizers asking him to attend a meeting first if he wanted to attend the next rally. Scott and a second man, a Guggenheim Elementary alum, said they were paid after the Jan. 6 hearings at the HOPE Englewood office by a woman who pulled envelopes holding $25 in cash from a container full of envelopes. Scott said Watkins was in the room when the woman told him he had done them a “disservice” and handed him half the promised amount, but Watkins insisted he was not there. Watkins also denied he ever chided anyone for using the word “compensated” at the hearings. Watkins said he used neither church nor HOPE funds for the stipends. The money came from a “coalition of clergy” who have “money set aside for outreach in the community,’’ he said. Only at the last minute, Scott said, was he asked to choose from a list of prepared remarks and told not to support Crane. “If he calls that training and that’s what I was paid for, fine, but that’s not training,” Scott said. The Guggenheim alum also said he received no training before he boarded a bus outside HOPE’s Englewood office at 6921 S. Halsted on Jan. 6. He said he, too, was seeking assistance with energy bills when he was offered $25 to attend a rally. He said he was told the rally would be about “longer school hours” — an issue pushed by Mayor Rahm Emanuel, who announced last year that a long list of ministers supported his stand. “My position is, we want [schools] fixed,” said Watkins, whose HOPE Organization offers after-school programming and won nearly $1.47 million in Chicago Public School contracts since 2010. Updated: January 26, 2012 2:17AM Outrageous. There is no other way to describe the practice, revealed by the Sun-Times and other media, of ministers hiring “rent-a-protesters” to advocate for proposed Chicago public school closures. Four days after delivering the sermons on behalf of the "Longer School Day" in September 2011, the preachers who had pledged their support for Rahm Emanuel's campaign against the Chicago Teachers Union and Chicago's teachers loaded buses with protesters who marched outside City Hall prior to the September 8, 2011, City Council meeting. Substance photo by George N. Schmidt.Reporter Rosalind Rossi on Tuesday told the story of two men who said they were offered $25 to $50 to support the closures of two schools. Both men said they were asked to attend two separate closure hearings this month after they showed up to apply for financial help with their energy bills at the Englewood office of the HOPE Organization. The Rev. Roosevelt Watkins III, who runs the group, denies they were paid to protest, saying the money paid was for training. The facts say otherwise, including testimony by many who watched the so-called protesters, many of whom switched from pro-closure to anti-closure by the end of the hearings, along with the container of envelopes filled with cash seen at the HOPE office after the hearings. WBEZ profiled a third protester allegedly paid by HOPE and a fourth who said she was among a busload of rent-a-protesters paid at a different hearing by another church. We hope the outing of these rent-a-protesters will be enough to kill the practice. It makes a mockery of democracy and is all the more galling because it comes at a time when honest public debate is needed more than ever. The Chicago school system is at a critical juncture, debating whether to take the dramatic step of closing or turning around 14 schools, as well as significantly lengthening the school day. Thus far, the debate has been mostly shrill, fueled by a flame-throwing Chicago Teachers Union and by a CPS public relations machine singularly focused on its agenda, particularly nothing less than a 7 -hour school day. It was encouraging at Wednesday’s monthly Board of Education meeting to detect a noticeable cooling off. Board members seemed more open to listening to parents and teachers, while the CTU and its allies made their points in a more reasoned manner, checking the vitriol at the door. The Chicago Public Schools inspector general said Wednesday he is investigating reports that bused protesters were paid to carry signs or read scripts at school closing hearings. News of the probe came as Mayor Rahm Emanuel sloughed off questions about whether the practice was appropriate. Meanwhile, Ald. Robert Fioretti (2nd) blasted “paid protesters” he said showed up on three buses at Jan. 6 hearings on whether to phase out Crane High School. 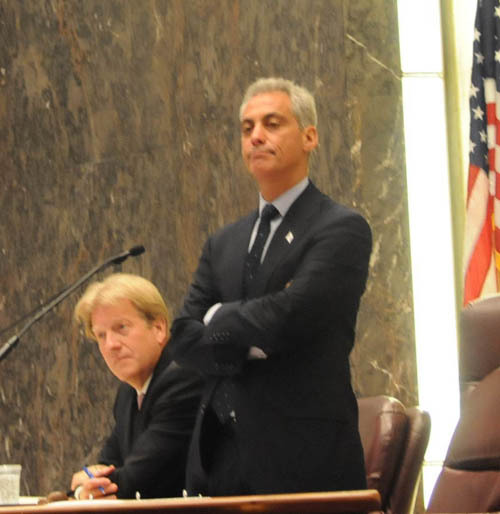 He urged Chicago Public School officials to omit their comments from the hearing’s record. When asked by a Substance reporter what schools they were from, the majority of the protesters at Chicago's City Hall on September 8, 2011 refused to answer, while many of them covered their faces (above) when photographed, or carried the signs they had been given upside down, and were unable (or unwilling) to explain what the signs meant. Substance photo by George N. Schmidt.Their appearance was “embarrassing” and “subverts our public process ... wherever the money came from,” Fioretti said during the school board’s monthly meeting. The Chicago Sun-Times on Tuesday reported that two men said they were duped by the offer of cash to attend Jan. 6 school hearings while seeking help with their energy bills at the Englewood office of the HOPE Organization, headed by Rev. Roosevelt Watkins of the Bethlehem Star M.B. Church. Both said they didn’t realize until the last minute that they were supposed to side with the phase-out of Crane High or the closure of Guggenheim Elementary — proposals they didn’t support. Joining a caravan of protesters in buses, one man said he was paid $25 just to show up and then given a pre-made sign; the other said he was promised $50 to speak and given a pre-crafted script. Watkins has acknowledged he organized busloads of protesters to attend the Jan. 6 hearings but said any “stipends’’ they received were for pre-hearing “training” on “community organizing.” He could not say when that training occurred. Both men insisted they received no training. The mayor was not concerned. 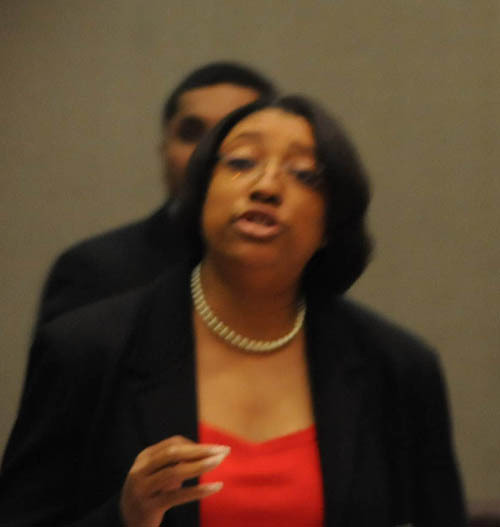 Following the noisy sidewalk protest on behalf of the "Longer School Day" on September 8, 2011, Alderman Latasha Thomas (above) introduced a Special Order of Business at the City Council meeting, calling on Chicago Public Schools to create the Longer School Day. Substance photo by George N. Schmidt.Fioretti Wednesday joined a long line of speakers who called on CPS to halt its plans to close, phase out or hand over schools to outside managers. Fioretti said incoming-freshmen in Crane’s attendance area would be absorbed by four “marginal,” low-scoring schools that also are on academic probation. Mixing different populations could trigger the kind of spike in violence that haunted previous similar closings, he said. The alderman urged CPS to back a Crane-written plan for the school’s own “turnaround” and said Ald. Jason Ervin (28th), Ald. Walter Burnett (27), State Rep. Derrick Smith (D-Chicago) and State Sen. Annazette Collins (D-Chicago) also opposed the Crane phase-out. A group of people fighting the phase out of Dyett High charged CPS had “destabilized” the Bronzeville area with its policies and shakeups. Over the years, King was converted from a neighborhood to a selective enrollment high school; Dyett was changed from a functioning middle school to a high school with only seven books in the library and no honors classes; and Price was changed from an elementary to a middle school, they said. Jitu Brown of the Kenwood-Oakland Community Organization also warned of spikes in violence if Dyett attendance-area students are routed elsewhere. He urged the board to approve a community-written plan for the area. Jackson Potter, chief of staff to Chicago Teachers Union President Karen Lewis, questioned why the board was scheduled Wednesday to approve millions in renovation funds promised as part of the fresh start of targeted schools, even though those schools’ shakeups aren’t up for a vote for a month. “It gives the appearance they already made up their minds’’ about school shakeups, Potter said. However, School Board President David Vitale said the renovation budget was “adjustable” and could be changed later. This story is still developing. And we are waiting for information requests going back to August that the Board is refusing to release. What is public school district doing spending federal and state funds on an "Office of Faith Based Outreach"? My understanding of the US Constitution is that there is to be a separation of church and state, so under what authority did Brizard establish an office that works with churches? Wikipedia has a good history. I have about 150 articles, dating form Bush's launch of faith-based initiative, which was designed to lure Blacks to Republican Party. But then Dems also saw the benefits. TFA has community faith relations dept. I was happily stunned to see the main stream media (WGN and the Sun-Times) actually cover the "Rent a Protestor" corruption of the School Closing process. I am hoping this will be a watershed moment for these hearings. Let's hope the people of Chicago are as outraged about this as those of us who work in CPS. I also hope the mainstream media follows up on this story. Who is getting paid and from whom or what entity?